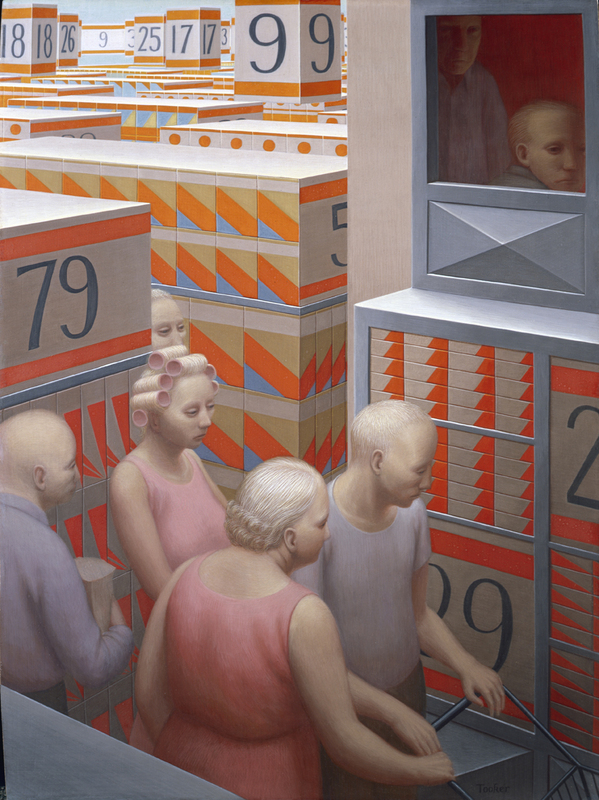 The exhibition of paintings by George Tooker currently on view at the DC Moore Gallery is entitled "Reality Returns as a Dream." Many of the the subjects in these paintings seem as if they are in a dream-like trance. There are bathers, office workers, market shoppers, all with a distant look in their eyes. In the 1940s, Tooker took classes at the Arts Students League in New York. 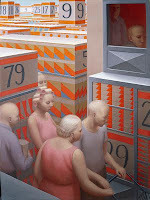 There he met Paul Cadmus, who encouraged him to work in a paint medium called egg tempera. This type of paint is fast-drying, and yes, it is made by mixing a pigment with egg yolk. It produces the luminous and rich looking quality that we see in paintings of the late Renaissance and Baroque period. 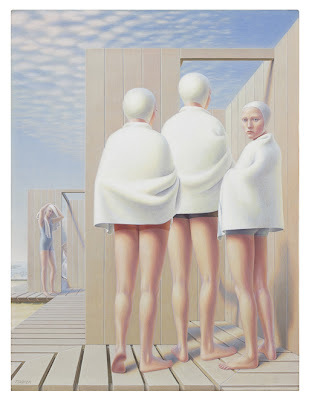 Mr. Tooker's career spanned over sixty years and his style was sometimes described as Magic Realism. He, however, did not care for that label, and explained that his images were the essence of experience. He was quoted as saying, "I am after painting reality impressed on the mind so hard that it returns as a dream, but I am not after painting dreams as such, or fantasy." This is a memorial exhibition as the artist died earlier this year. The show is up until August 5th, 2011. Perfect for all ages.